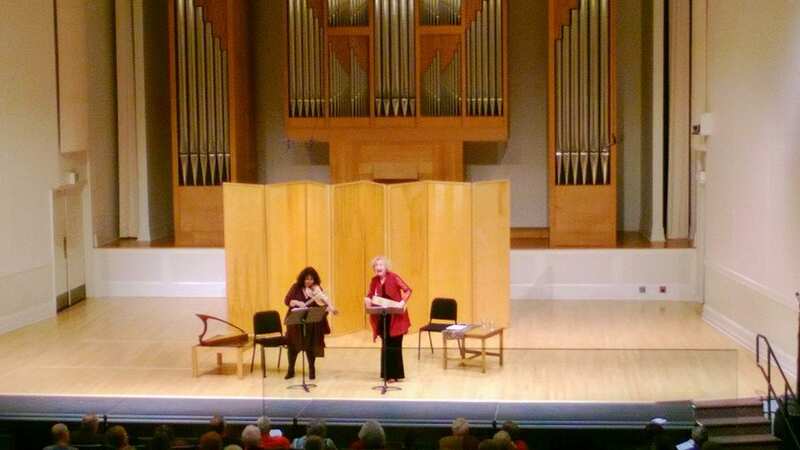 The 2018 Musicking Conference started with a show-stopping performance of Medieval music by specialists Anne Azéma & Shira Kammen. Anne’s captivating story-telling and mesmerizing melodies were beautifully accompanied by Shira’s brilliant improvisations on vielle & harp. 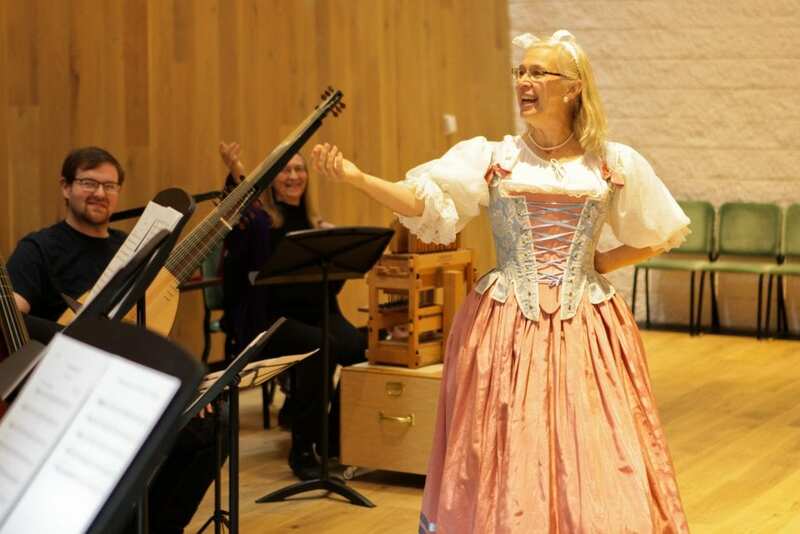 Their program took us on an imaginary pilgrimage through texts and songs from the Middle Ages, and created an air of excitement that lasted throughout the conference. Distinguished guest artist Peter Van Heyghen, professor of historical performance practice at the Royal Conservatories of Brussels, The Hague, and Amsterdam, and UO’s historical performance practice specialist, professor Marc Vanscheeuwijck, began working with the university camerata orchestra and chamber choir on April 2nd to prepare students for their upcoming performance of Mozart’s Requiem. Both groups learned how to make informed musical choices regarding text pronunciation, phrasing, and ornamentation, using the modern instruments that they have access to every day. Throughout the conference, students participated in master classes and workshops where they continued to learn about how early musics were connected to the cultures from which they came, and how understanding and engaging with concepts like Renaissance solmization and Baroque ornamentation practices leads to more convincing performances. 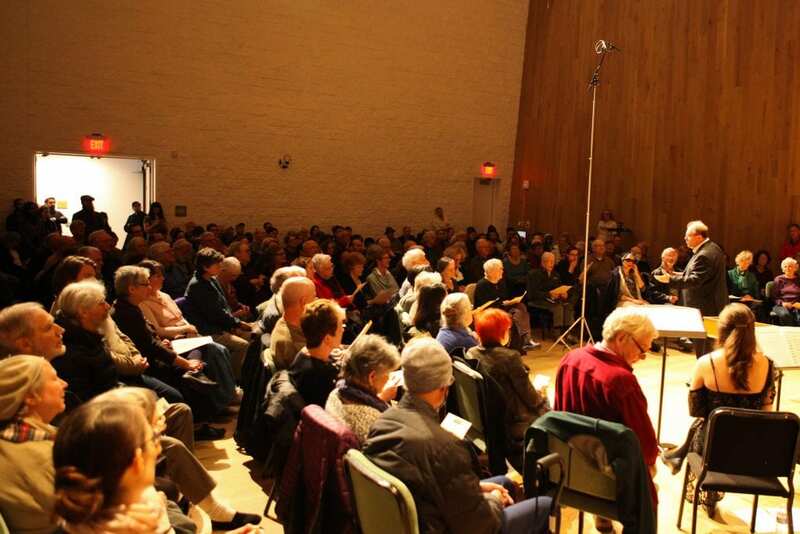 On Thursday, April 12th, Peter Van Heyghen, Marc Vanscheeuwijck, Margret Gries, Holly Roberts, and Emma Lynn performed their concert, “Paradiso Armonico” to the largest audience Tykeson Rehearsal Hall has seen yet! UO productions manager Thor Mikesell did a great job of moving audience members in to sit behind the performers and along the wall so everyone was able to participate in the Musicking! On Saturday morning, April 14th, we switched gears and welcomed younger “musickers” into Berwick Hall for our Musicking Family Day! 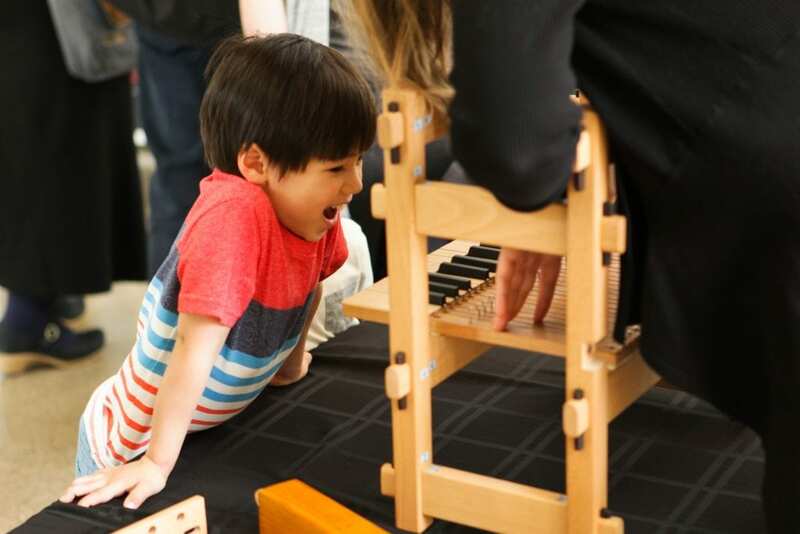 OrgelKids USA, a Corvallis-based nonprofit organization, taught us how to build pipe organs, and we worked together to build an organ that could be played while Tamara Caulkins taught us the basics of baroque dance! 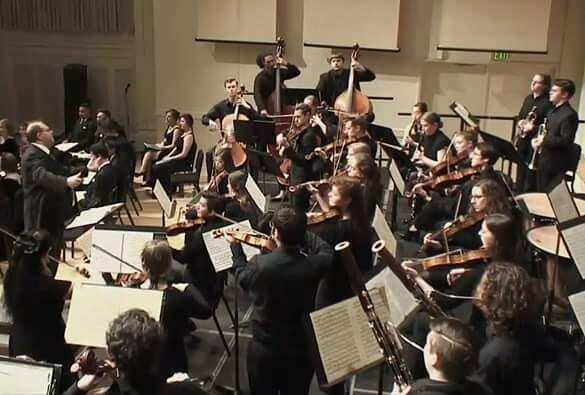 Saturday evening brought us to the end of our 2018 conference, where we heard the UO chamber choir and UO camerata orchestra perform their culturally informed rendition of Mozart’s Requiem in 1790s stage set up. 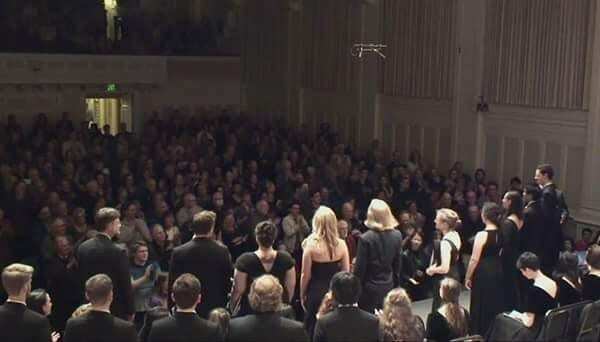 This performance was a once in a lifetime experience for performers and audience members alike, and we watched in awe as this iconic piece was performed with the choir in front of the orchestra and with two conductors. 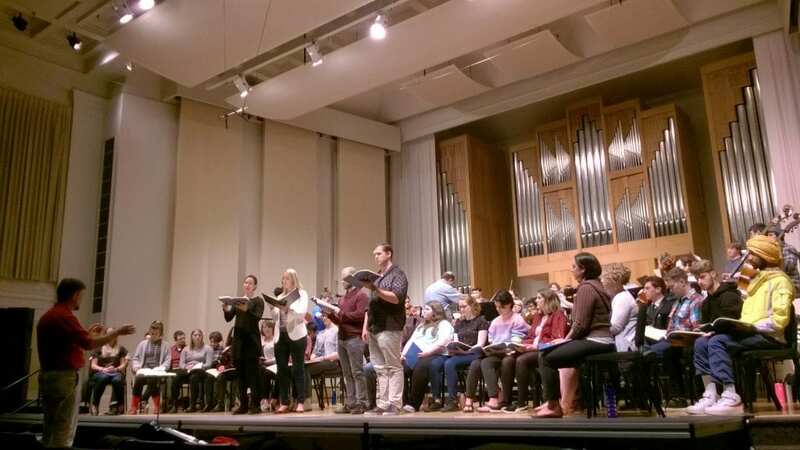 Those who witnessed this concert should consider themselves fortunate, as it turned out to be one of the best-attended concerts in Beall Hall’s history! Every seat in the hall was filled, with more than 300 audience members watching from overflow seating and via livestream around the world! Click HERE to see more 2018 Highlights!